The historical collection is made up of newspapers, books, magazines and other printed publications spanning over 100 years of football. However, the treasure chest of the ISA exhibits include rare championship medals, and match worn jerseys. Other memorabilia from game-day programs to tickets as well as the odd glass, ceramic or painting depicting the world's sport are also featured. One of the largest soccer card collections in the world are gathered here with both famous and forgotten players on cigarette, trade and gum cards dating back to the turn of the century. This site is all about the world's passion for Association Football or Soccer. Here you'll find information about the history and art of the game through the collection of the I. S. A.. Many of the items are rare and one-of-a kind. The Archives also contain data and historical fact rarely found in any other place. We have artifacts that span over 100 years! The I.S.A. collection has been exhibited around the world. Corporate events, International tournaments and Club and Federation celebrations have brought together football fans to see history. We will be updating this site frequently as we add to the collection, so check back often! 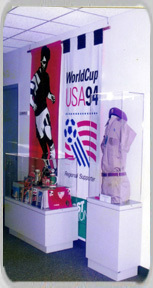 The International Soccer Archives was founded in 1989. Today the ISA collection includes over 10,000 significant items of soccer memorabilia from around the world.